My company works with several charitable organizations (we do screen printing, embroidery, advertising items) and during the course of dealing with these organizations we have met a lot of great people. One of the organizations we deal with heavily is AFAN (Aid For AIDS of NV). During our support of AFAN I have met some very nice, but unfortunately ill, people. Seeing these people couping with their illness makes me question why we can't find a cure for this dreaded disease. The thing is it has never hit home with me this much until now. 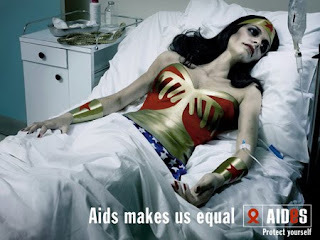 While looking through some photos I came across this picture of Wonder Woman and it really bothered me. Meeting real life people with AIDS has encouraged me to support and help charitable organizations as much as I can, but seeing this ad has really made me think we really need to do something about deadly diseases like AIDS and cancer. I know times are tough, but please give to your favorite charity. They need it now more than ever.